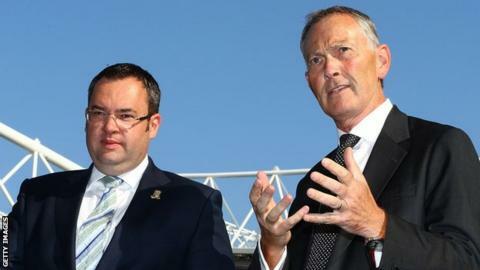 A Football Association commission's plans for a B league could "wreck" the English football pyramid, says Premier League boss Richard Scudamore. FA chairman Greg Dyke wants to improve opportunities for young English players by creating a new tier that would feature Premier League B teams. Scudamore acknowledged the "challenge" of developing more English talent. But he added: "I don't believe we should be wrecking the pyramid of English football to achieve that." The proposal to introduce a League Three between League Two and the Conference is an attempt to increase the amount of homegrown players in the Premier League. Only 32% of starters in last season's top flight qualified to play for England, compared to 69% 20 years ago. The FA commission set up to address the problem also called for a ban on non-European Union players outside of the top flight, the development of "strategic loan partnerships" between clubs, as well as a reduction in non-homegrown players in Premier League squads. The proposal for a B league drew support from Liverpool boss Brendan Rodgers and Everton manager Roberto Martinez. Dyke said Manchester United and Manchester City were also enthusiastic. But League One and Two clubs have been critical, with Peterborough chairman Darragh MacAnthony saying: "This can't be allowed to happen." Scudamore, the Premier League's chief executive, added: "We all understand the issue. How do you take all this investment and progress in youth development and, from 18 onwards, convert them into players who are capable of holding their own in the Premier League and becoming England-qualified talent? "That is the challenge we all have. "I can't contradict what I have said before many times before and truly believe. We must see if there is a credible alternative before we go decimating the Football Conference and the Football League. That is something we need to try and protect almost at all costs." Would a B league produce more Xavis and Iniestas? Read more on FA commission: Would a B league produce more Xavis and Iniestas?